Geneva—A historic Fabergé tiara given by the regent of Mecklenburg-Strelitz in northern Germany to his bride in the early 1900s is heading to auction for the first time next month. 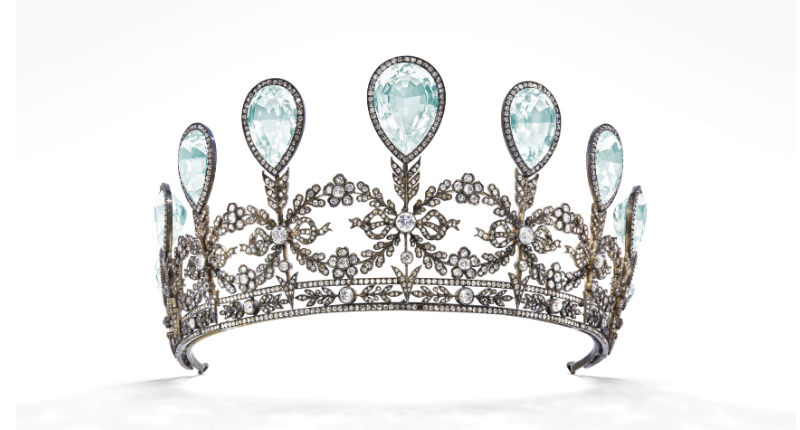 A grand duke commissioned this royal tiara, comprised of nine graduated pear-shaped aquamarines and old, cushion and rose-cut diamonds, from Fabergé in 1904. Made in 1904 as a wedding gift from Frederick Francis IV, Grand Duke of Mecklenburg-Schwerin (1882-1945), to Princess Alexandra of Hanover and Cumberland (1882-1963), the piece is comprised of nine graduated pear-shaped aquamarines and old, cushion and rose-cut diamonds. It will make its auction debut more than a century after its creation at Christie’s Magnificent Jewels sale in Geneva on May 15, where it’s expected to sell for between $230,000 and $340,000. The tiara features forget-me-not flowers tied with ribbon bows, symbolizing true and eternal love, Christie’s said. They are being pierced by arrows representing cupid, an icon of endearment, attraction and affection. According to the auction house, the Grand Duke’s mother, Grand Duchess Anastasia Mikhailovna of Russia, was a renowned collector of Fabergé pieces and encouraged him to order the wedding present for his bride at the jeweler’s atelier in St. Petersburg. Archives show correspondence then between the Grand Ducal Cabinet of Mecklenburg-Schwerin and Eugène Fabergé deliberating on the commission of an important jewel. One of the letters dated May 10, 1904—less than a month before the wedding—offered possibilities of what the storied jeweler could offer: a diamond tiara for 10,000 roubles or an aquamarine and diamond tiara for 7,500 roubles. Using only aquamarines in the tiara, it added, wasn’t an option. Another letter referred to design drawings proposed by Fabergé for the top section of the tiara, which had been sent to the Grand Duchess Anastasia Mikhailovna for her son’s approval. These drawings went missing, though, and Fabergé said he had no copies for himself and didn’t know which design the Grand Duke had preferred. With only two weeks left until the wedding, he wrote to the Grand Ducal Cabinet, saying he had not yet received any instructions on how to proceed. He asked, for a second time, for the return of the drawings so he could continue his work. The responding letter, though, noted completion in time for the wedding on June 7, as the Grand Duke requested. But even for a royal piece, Fabergé’s response was simple: it was impossible to execute in such a short time. On her wedding day, Princess Alexandra ended up wearing the traditional Hanoverian nuptial crown set with diamonds that had been in her family for more than a century, commissioned in 1761 for King George III of England’s wedding to Queen Charlotte of Mecklenburg-Strelitz.